Today is a celebration of our support staff and the vital role they play in supporting our learners in all aspects of their lives. We have range of support staff in The Bridge and every one of them makes a valued contribution to every child that comes here. We have staff who lead and deliver: 1:1 Learning Support, Family Engagement, Therapeutic work, many interventions and an amazing administrative team. 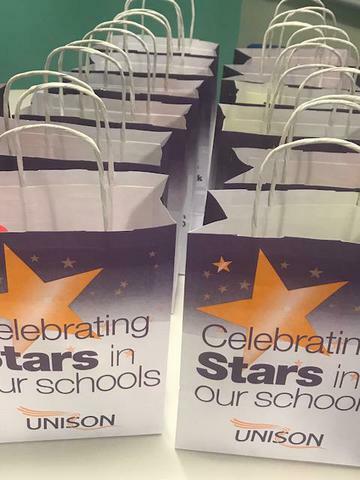 Unison the public services union has created this celebration day "Stars in our schools" to help schools show their appreciation of their support staff. 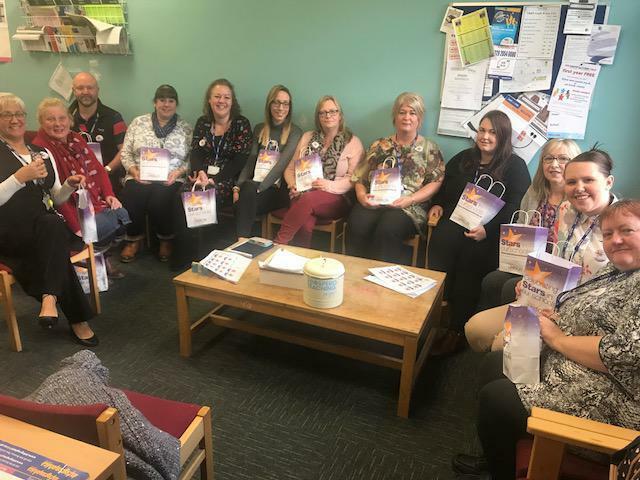 We held a special briefing this morning where each member of staff had a goodie bag and our sincere thanks for all their efforts. For our part time staff, we have their goodie bags safely in the office! From left to right: Carol, Anne, Andrew (supply staff), Maggie(supply staff), Charlotte, Tammy, Linda M, Amanda, Ami, Lynda A, Amy and Helen. Louise, Vickie, Emily, Charlotte and Rhieannon escaped the photo!